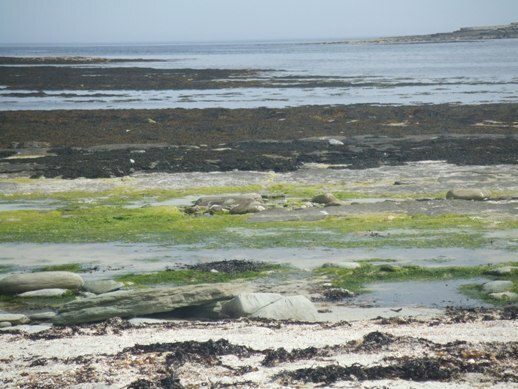 From Pierowall, as an excursion centre, I next crossed the beautiful land-locked bay to the pleasant little island of Papa Westray, which still commemorates in its name the Irish anchorite fathers. Papa is four miles in length by one in breadth, swelling away up from the shore in an easy slope, and terminating northwards in the bold promontory of the Moul. The green fields dipping down from the clustering dwellings on the central ridge, with the House of Holland conspicuous in their midst, exhibit traces alike of careful cultivation and of considerable fertility. Mr. Traill, the proprietor of the island, is one of the most intelligent agriculturalists in Orkney, and he has done his best to develop the resources of his patrimonial possessions. A soil that yields spontaneously rich crops of red and white clover is capable of being turned to good account in the hands of a skilful cultivator. For the fineness of its pasture and arable land Papa is not excelled by any of the other islands. On landing, I took one of the boatmen with me as a guide, philosopher, and friend, and he entertained me with stories of egg-gathering exploits in his younger days as we walked leisurely towards the How of Habrahelia. The place, thus curiously named, is a immense cave in a headland of the Moul. With its arched roof rising upwards of seventy feet in height, its broad expanse of smooth floor, and its echoing shadowy recesses, it resembles some colossal temple, sacred once to mystic rites, but forsaken now by priest and worshipper. Surveying its vast proportions I thought that haply the anchorite fathers, although they preferred cells to cathedrals, had knelt down under the arched roof of the temple-cave, and mingled their muttered prayers with the murmur of the sea. From the How of Habrahelia we had a pleasant saunter in the fine evening, to the southern extremity of Papa where a beautiful fresh-water loch extends nearly across the island. The loch is a favourite haunt of wild fowl, and amidst its waters there lies a fairy-isle, containing the ruin of a chapel, said to have been dedicated to St. Tredwall. So great was the veneration entertained for this female saint that the first Presbyterian minister of the parish could with difficulty restrain the people from paying their devotions at the deserted shrine. No doubt the sainted lady had won the savour of a good name by her miraculous cures of bodily infirmities. In another part of the island a ruin, in an old unused churchyard, marks the site of a second chapel, regarding which tradition is silent. Lying close to the east side of Papa we saw the little holm which abounds in varieties of sea-birds, such as the black guillemot, the red-breasted mergauser, the arctic tern, the black-backed gull, and the herring-gull. Flocks of eider ducks regularly frequented the holm at one time, but the visits of these valuable birds have only been occasional for a series of years. Dunn, the ornithologist, shot two when he visited Papa Westray in his fruitless search after the great auk - a rara avis which had not been seen about the island for many years previous to the time of his northern bird-hunting expedition in 1832*. On the day when Dunn shot his pair of eider ducks twelve score of young gulls were killed on the holm, and twenty score on the preceding day. In a previous chapter I have noticed the large quantities of auks sometimes caught in one day by means of nets. Wise in their generation, the proprietors of Papa Westray found that the feathers of seabirds were "covered with yellow gold," and the little holm, tenaciously haunted by gulls, continued from year to year their most productive preserve. The skorays, or young gulls, frequently supplied the place of chickens on the dining-table at Holland House, and the farm-servants feasted like princes on kittiwakes and their eggs. From my boatman guide I learned that the side of the holm farthest from Papa was the principal breeding-place of seabirds in former years. "Among the loose rocks and stones," he said, "the eggs used to lie as thick as buckies on the beach, and they often crunched under the feet of the egg-gatherers." Though the holm is still frequented by cormorants, divers, puffins, and birds of the gull, kittiwake, and auk tribes, the number of seafowl has diminshed of late years, and they seem to be passing away, like aboriginal races befor the face of the white man. Papa Westray is celebrated in Norse history as the scene of the treacherous death of Earl Ronald, and the leading incidents of the tragedy recurred to my mind as we walked back to our boat when the orange, crimson, and purple glories of the Orcadian summer's night were mirrored in the calm sea. Ronald, who won his spurs in Russia, and who excelled his predecessors in stateliness of person and nobility of mind, lived in great state at his palace in Kirkwall, attended by a strong force of guards. In the winter of 1046, when the Yule days drew nigh, he sailed with a number of attendants to Papa Westray with the purpose of securing his usual stock of malt for Christmas ale. One night during his stay in the island, as he sat over the fire conversing with his guards, an alarm was given that the building was in flames and surounded by armed men. Thorfinn, Earl of Caithness, was the leader in this treacherous raid. Preferring the chance of death by the sword to the certainty of death by the fire, Earl Ronald made a bold dash through the burning doorway, cleared the blood-thirsty crowd of assailants without, and disappeared swiftly in the darkness. Thorfinn at once knew that the earl, who alone could display so much strength and agility, had made his escape, and ordered his attendants to follow in pursuit. The fugitive earl succeeded in reqaching the seaside in safety, but the barking of a favourite dog discovered his place of retreat, and Ronald was inhumanly butchered, Thorkel the Foster acting as chief executioner. On the next day the ship of the slaughtered earl, laden with malt, was steered towards Kirkwall, having her poop and stern adorned with the shields of the slain. The guards whom Ronald had left at home, deceived by the appearance of the ship, crowded down to the shore to welcome the earl on his return with the Christmas malt, but when the vessel reached the land they were immediately set upon by Thorfinn's retainers and shared the same fate as their hapless chief. Thus Ronald died and Thorfinn reigned in his stead, receiving absolution from the Pope for murder and piracy. From Papa to Pierowall we had a most delightful sail in the stillness of the long, lingering, lovely twilight. The colours of the sky were softened into delicate saffron hues as they mingled with the liquid sheen of the sky. Voices from the land - the plaint of peewits, the far-heared craik of the rail, and the wild notes of water-fowl - blended finely with the shrill pipings of shore-birds and the murmuring wash of ebbing and flowing waves. It was midnight when we hauled up the boat on the sandy beach.